Never one for PR-speak, Chrysler-Fiat boss Sergio Marchionne was particularly expressive at the Detroit auto show in January when discussing Fiat's new Alfa Romeo high-performance sedans. 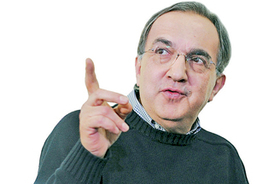 "I cannot come up with a schlock product, I just won't," Marchionne told a room of journalists. "I won't put an American engine into that car. With all due respect to my American friends, it needs to be a Wop engine. There are some things that are well done in Italy." Only it wasn't his American friends who took offense. The Italian-American ONE VOICE coalition of New Jersey mounted a campaign against the remark and called for an apology. And last week Marchionne did indeed ask for absolution. In a letter to the organization, Marchionne said he, as an Italian, had used the pejorative term "in jest." "Having had to live through a period of integration into another country a number of years ago, I am keenly aware of the negative implications of stereotyping and the significant efforts required to undo its effects," said the Italian-born CEO, who moved to Canada as a young man and has dual citizenship. "I extend my apologies to anyone who may have been offended."